So far i have been busy with a few things, not getting as much done as i would like .. but hopefully that will change by the end of the year. I was able to see the NIN|Soundgarden show here in dallas last night (8-17-14) i have to say not a huge Soundgarden fan however they sounded really great did a great performance. I would say seeing them live is much better than listening to them in an album. NIN however was really awesome. I know now why every video they have is awesome they do the most interesting effects during there show i mean this is how the got most of his videos I’m assuming. The Sound set up for NIN was done well you could feel the base. the music was epic even they added some tribal beats to a lot of it and i have to say NIN sounds just as awesome live as they do in their albums, but they are much more fun live! It was a great show! I have one complaint i dislike how venues do not allow you to at least bring in cameras, phones don’t take the best photos unless you are in front row. But putting that aside i am glad i could see them since i been following NIN since 88 great experience for getting to see one of my favorite bands for the first time! up coming online events events. 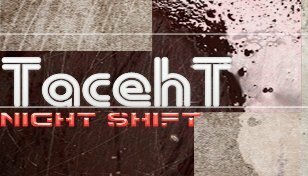 TacehT Night Shift – EP: Ohhh Dear.. She Is here!